These are like Rice Krispie Treats, only with cornflakes. 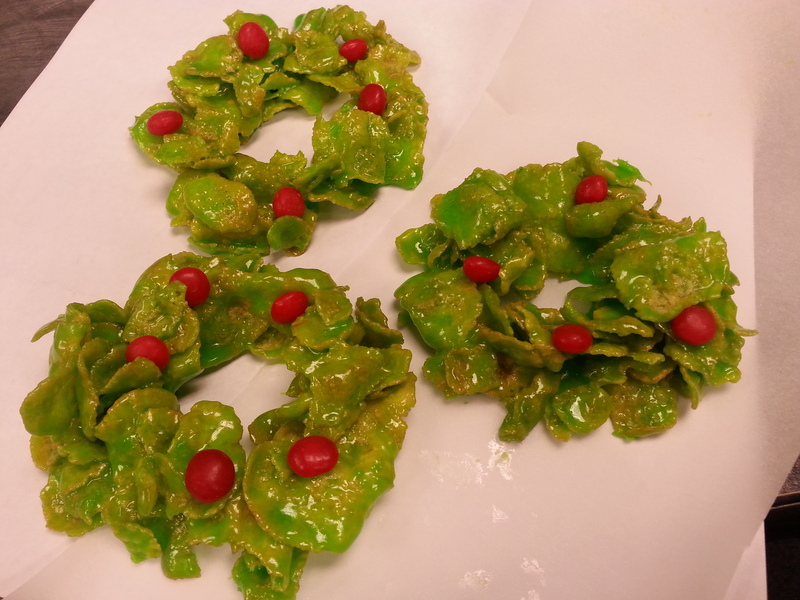 They are a fun dessert to make at Christmastime, and very easy, too. Plus, they have only five ingredients. To prepare, butter two or three baking sheets — you will form the wreaths on them later. Put the cornflakes in a large bowl. In a medium pot over low heat, melt the margarine. Add the marshmallows and stir constantly until completely melted. Add the food coloring, starting with 1 tsp. but adding more as necessary until the mixture is dark green. (The ones in the picture above aren’t as dark as I intended.) Pour the marshmallow mixture over the cornflakes and mix carefully with a spoon until completely coated. With buttered fingers, take out a small handful of the coated cornflakes (just enough to fill your palm). Put it on the buttered baking sheet and form into a wreath. Put four or five cinnamon candies on the wreath to look like berries. Refrigerate the wreaths for several hours before serving. Use a spatula carefully to lift them off the baking sheets. *I found the Red Hots in the baking aisle, next to the bottles of sprinkles — not in the candy aisle. This cake turned out to be a big success — a straightforward recipe with delicious results and a rich chocolate flavor. As you can see, it was designed for Easter. The top ridge of the cake caves in, creating a base for a whipped topping that looks like a nest. 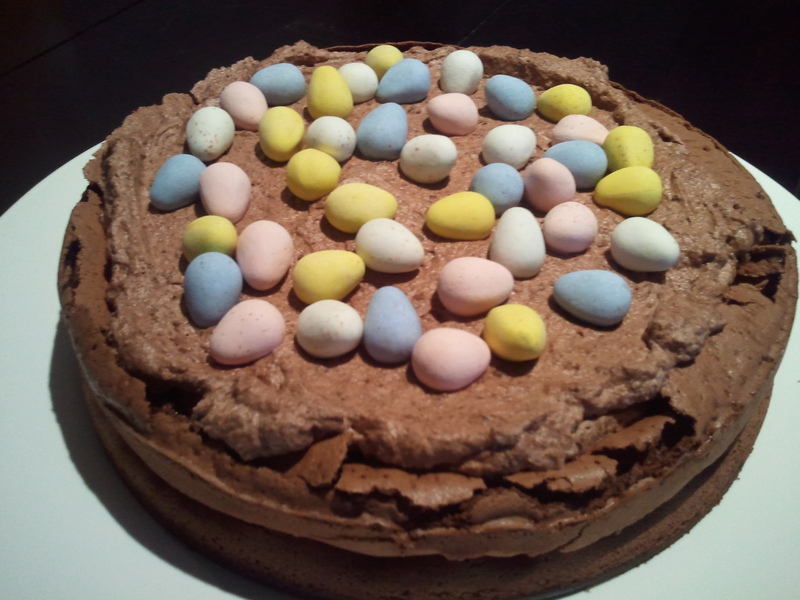 Lay some candy eggs on top and you’ve got much more than a flourless chocolate cake — you have an Easter Egg Nest Cake. This was a Nigella Lawson recipe I clipped from The New York Times eight years ago. I don’t tend to have a lot of luck with her recipes, but as I suspected, the recipe’s appearance in the Times meant it was a winner. I hope you have similar results. 1. Heat oven to 350F degrees. Line the bottom of a 9-inch springform pan with parchment paper, then grease the top of the paper. 2. For the cake, stir the softened butter into the just-melted chocolate and let cool. Whisk 4 egg whites until foamy (this is best done in a stand mixer). Gradually add 1/2 cup sugar and whisk until whites hold their shape but are not too stiff. Reserve. 3. In a separate bowl, by hand, whisk 2 whole eggs and 4 egg yolks with 1/3 cup of sugar and vanilla until combined. Stir in chocolate to mix. 4. In three additions, fold whites into chocolate mixture*. Pour into prepared pan and bake for 35 to 40 minutes, or until cake rises, cracks, and center is no longer wobbly. 5. Cool cake on a wire rack; the middle will sink and the sides will crack. Carefully remove cake from pan and place on serving plate. 6. For topping, whip cream with vanilla until it is firm but not stiff. Fold in melted chocolate. Fill top of cake with whipped topping, easing it out gently toward the edges. Arrange candy eggs on top. *A tip for folding mixtures: Folding is not the same as stirring. It requires gentle and methodical mixing with a spatula. Holding the bowl on the left side, cut through the batter with the edge of the spatula from left to right, then lift upwards with the broad side of the spatula along the half of the bowl closest to you. Give the bowl 1/4 turn and repeat, doing this until the batter is slowly mixed. Doing it this way preserves the air bubbles in certain batters where the bubbles are necessary for lift.